Melton Classics offers the industry’s most comprehensive selection of square fiberglass columns. Whether your architectural column project calls for square tapered columns, simple straight tapered square porch columns or a Craftsman or Arts and Crafts style square column, Melton Classics has the perfect column design to meet your needs. Keep in mind that the economical manufacture of custom square fiberglass columns and pillars is our specialty. Fiberglass square columns are a simply elegant way to add the look of substance and classical architecture design to any structure. Melton Classics offers our durable and beautiful square fiberglass columns in a wide array of quality materials. Please call one of our experienced square fiberglass column specialists at 800-963-3060 for a free consultation and quotation on your square fiberglass column needs. Melton Classics offers the industry’s most comprehensive selection of column products, and our customers have numerous building applications, materials, finishes and designs. Therefore, we feel it is important to offer our customers experienced counsel to assist them in selecting the ideal square fiberglass columns for their project. We begin by listening closely to our customer’s needs and desires. We ask questions to ensure we understand your design goals, and educate you on all your options. Then based on our three decades of column experience, we consult with you to help you select the ideal square fiberglass columns product for your specific design, application and budget. The extensive selection of square fiberglass columns offered by Melton Classics are the industry standard for quality and design. Square fiberglass columns are versatile additions to both an exterior or interior project whether you are defining a small entryway, or an expansive porch. 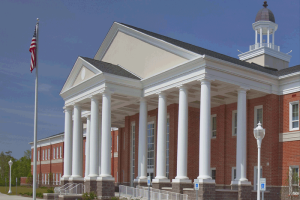 Square fiberglass columns can be used for residential, commercial, and industrial applications. With our large selection of column materials and designs, Melton Classics has the perfect columns to enhance the beauty of your building project. Melton Classics also offers load bearing round columns or column covers to ensure you have the right column for your construction application. Our large selection of prefinished and maintenance free square fiberglass columns are offered in a variety of beautiful prefinished colors and textures to fit and design need. From contemporary columns to custom columns to classically authentic columns, Melton Classics has the ideal columns for your design, application and budget. Please call one of our experienced column specialists at 800-963-3060 for assistance in selecting the ideal square fiberglass columns for your project.